Wednesday in Florence saw us rushing through more museums and historic churches in between the continuing terrible storms. 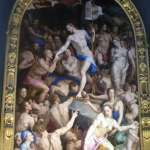 We spent most of the day at the enormous Palazzo Pitti, home to a tremendous collection of art and decorative items. The storms became so severe that even when we were finished touring the museum, we remained under cover in their large courtyard, watching as torrents of rain poured down onto the ancient stonework and lightning flashed over the distant hills. When the weather finally cleared, we spent a little time shopping and strolling around the Oltrarno and decided to stay on that side of the river for dinner that evening once again. 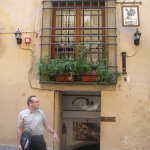 One restaurant I’d wanted to try based on good reviews, Osteria del Cinghiale Bianco, sadly was closed for the evening. 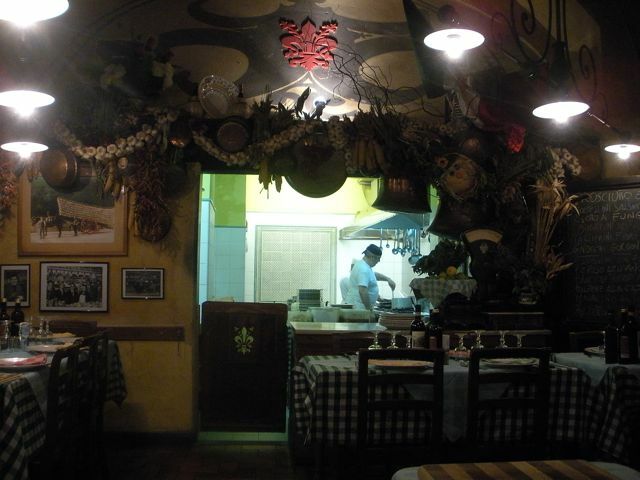 However, nearby we spotted the tiny Trattoria Angiolino, which captured our curiosity with their tempting menu of Tuscan classics and quaint-looking interior. We waited around until opening at 7:30pm and were the first to be seated for the evening. 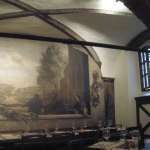 Trattoria Angiolino is located in a historic building which once served as the stables for Palazzo Frescobaldi. 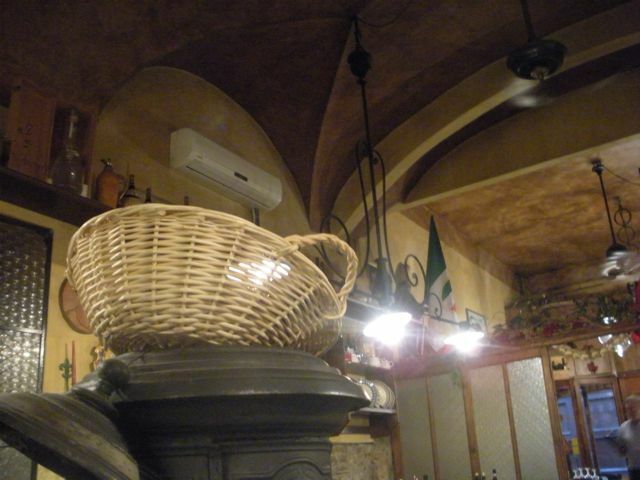 A vaulted ceiling, stone walls, and typical Tuscan decorations create a warm and cozy atmosphere. Our waiter, an older gentleman like most of the staff, seemed to speak very little English and the menu was entirely in Italian, no English translation. 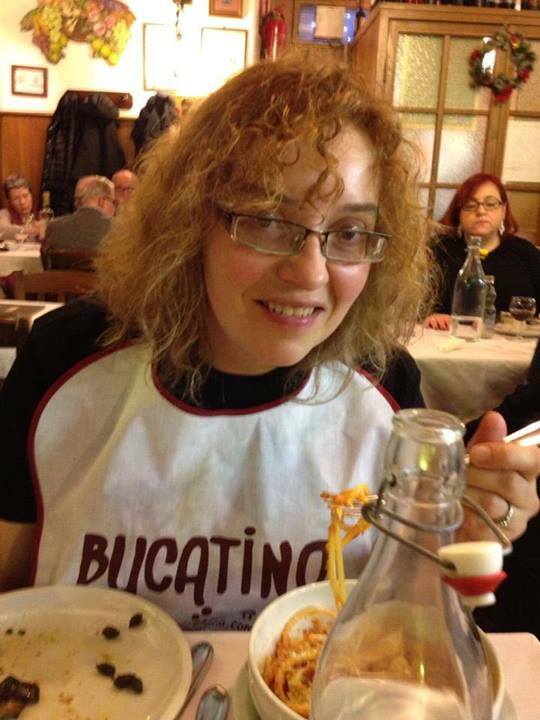 It’s a good thing that most of my limited Italian vocabulary revolves around food. We ordered a bottle of red to start as a hearty, meat-based meal was on our agenda. 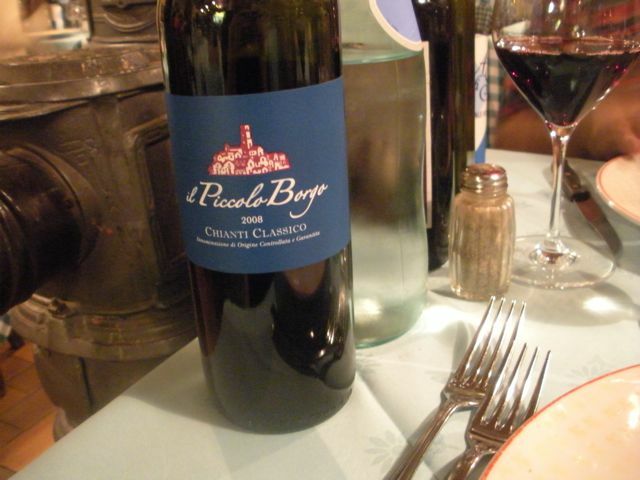 The Piccolo Borgo Chianti Classico was nice and smooth, almost dangerously easy to drink. We dug in to two delicious starters, an order of Crostini Toscano and an arugula salad topped with fresh ricotta cheese and white beans. 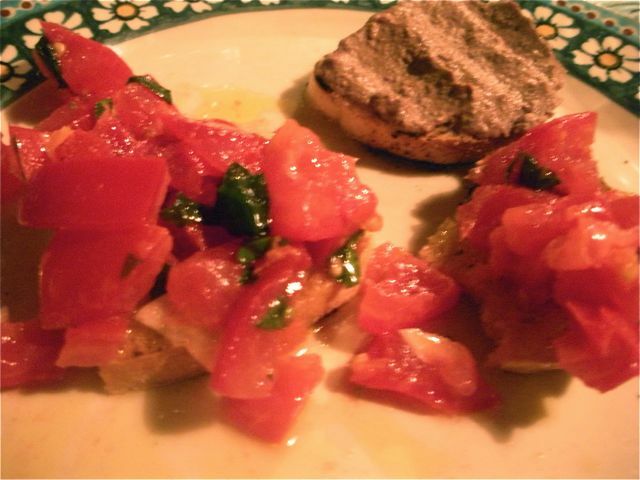 The crostini here was a generous plate of mixed toppings of marinated tomatoes and chicken livers. 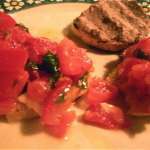 The tomatoes were ripe and rich in flavor and only lightly seasoned with olive oil, salt, pepper and perhaps a touch of garlic. 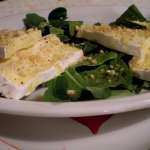 The salad was outrageously good, with thick slices of rich cheese dressed in pepper, salt, oil and crumbled beans. A wonderful start which promised the remainder of the meal should be a good one. 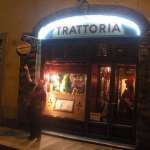 I should note that my companion was seated facing Trattoria Angiolino’s open kitchen, and enjoying quite the show by this point of the evening. The kitchen was manned by two older gentlemen both moving in absolutely no rush, no hurry, just with fascinating care and precision. “Hell’s Kitchen” it ain’t at Trattoria Angiolino. 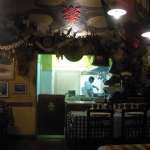 One of the two chefs was primarily focused on preparing the meats while the other handled pastas, sauces and the stove. Occasionally when needed, one of the waitstaff would dash in to lend a hand, but in general we had the impression of a small staff which had been tending to this kitchen, and this menu, perhaps for their entire lifetime. If you can, sit close to the kitchen here to enjoy the entertainment along with your meal. For our primi, we chose a pasta special featuring zucchini blossoms and the ribollita. 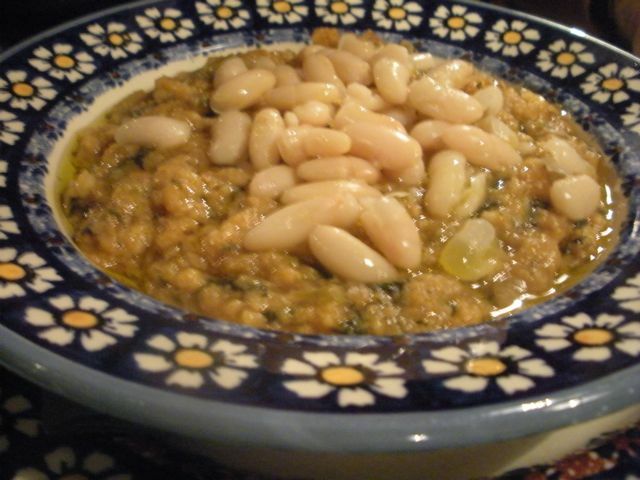 The ribollita was thick and hearty, topped with wonderful whole cannellini beans – clearly not of the canned variety but freshly cooked on the premises. 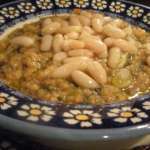 This classic Tuscan soup can easily be a meal all on its own. 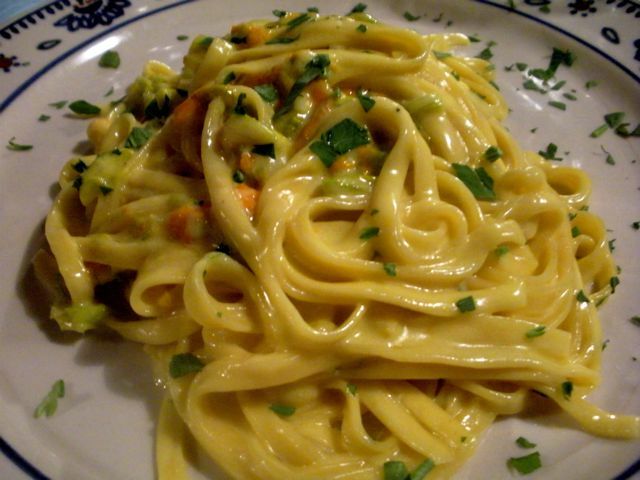 My pasta, however, was easily the star of the evening. I love zucchini blooms in cooking yet they are very difficult to come by in the United States, with a short season and even shorter shelf-life. My companion declared my dish the best pasta we’d had in Italy (to date for the trip, at least), and I must concur that it was delightful. 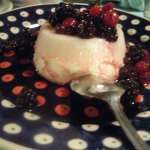 Again, in Tuscan style the flavor was not overpowering, just subtle, creamy and fresh-tasting. 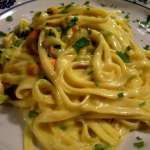 Sage and parsley added a touch of fresh greens to what tasted like homemade noodles coated in a light cream sauce. A very happy-making dish. For meats, we tried two dishes which met with great approval from our waiter when we ordered them. 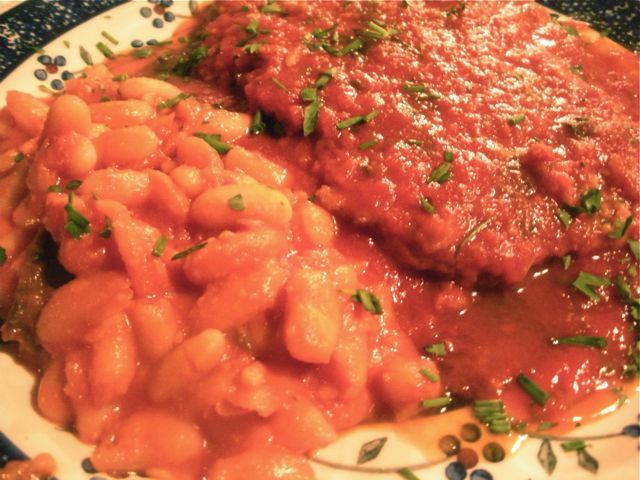 Mine was the steak “Livornese” style, featuring a tender, thin cutlet served in a flavorful tomato sauce. I had not expected it to be such a large piece of meat, nor to come with the wonderfully spicy, sauced side of white beans. 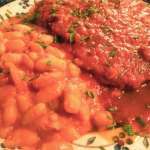 I loved the beans most of all, which had a hint of anise or fennel seed to their flavor, and worked so well with the steak. 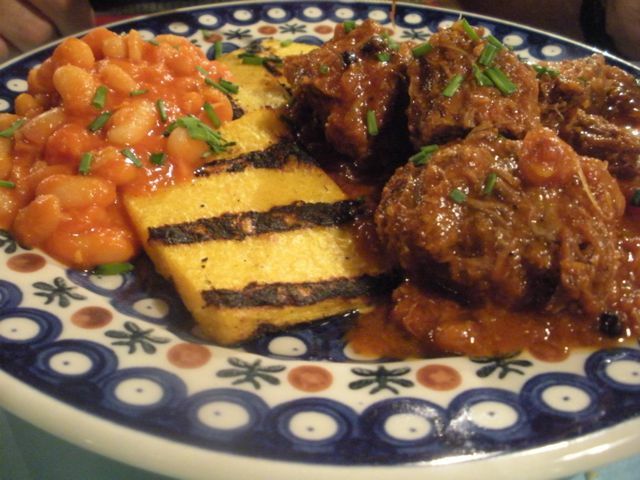 My companion had their version of beef stew, served with grilled polenta and more of those wonderful beans. 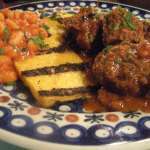 The stew meat was fork-tender and tasted of a long, all-day simmer in the kitchen with spices and vegetables. Wonderful stuff. 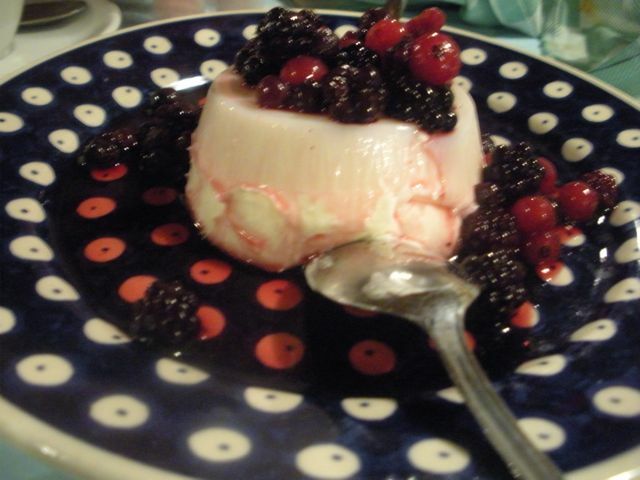 I don’t know how we had any room for dessert, but the panna cotta with fresh berries was immensely soothing – as was my grappa and espresso. 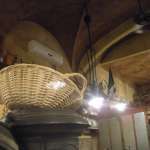 A curious surprise came upon receiving our bill – for all of this food, wine and drink the total was only 90 Euros. Indeed, we went item by item, including coperto, and saw it correctly totaled to 97, then crossed out and deducted to 90. Since language was a bit of a barrier and honestly, I am not one to complain about a reduced bill, we took it and paid “as is.” The only possibility I could think of was that our waiter seemed delighted all night that we had ordered a full three-course dinner in true “Italian style”, unlike other tables of tourists that entered later only to order a pasta and bottle of mineral water or table wine. Did they like us and just decide to take a few dollars off the bill? 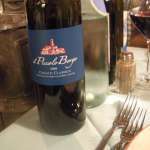 Was an item listed at too high of a price on the menu, such as our wine (which I know was under 20 Euros even as listed)? I honestly have no idea. 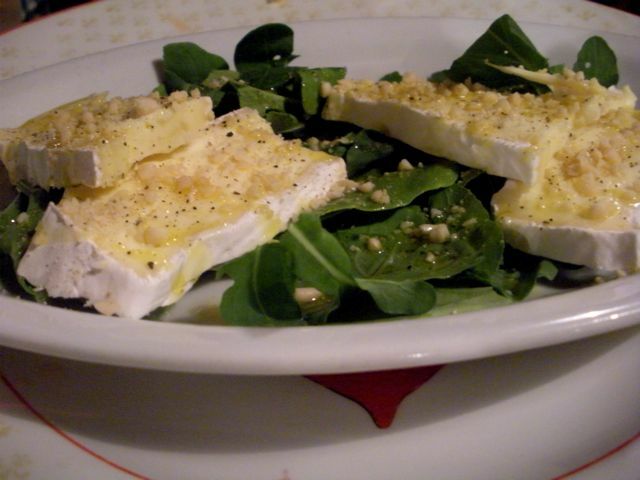 Overall, Trattoria Angiolino was a delightful choice for a dinner in Florence. The atmosphere, the food, and the “entertainment” provided watching the kitchen was all outstanding. Also enjoyable was how every dish came out on an entirely different color and style of plate, each seemingly meant to complement the food served precisely. 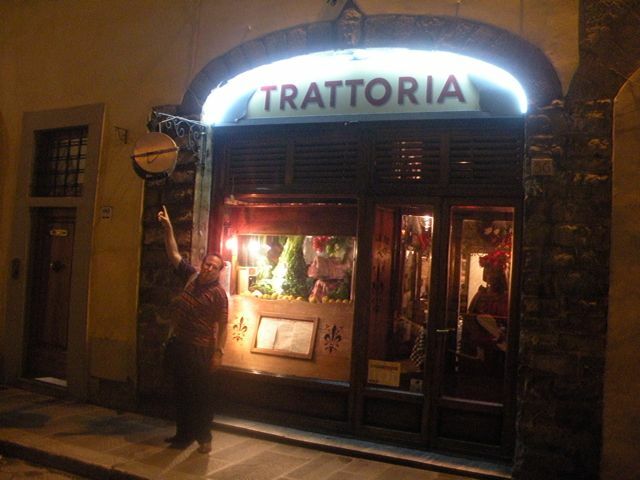 I would strongly recommend Angiolino to anyone looking for a very authentic, and reasonably priced, Tuscan meal in Florence. This restaurant is another one that will end up on my “must return” list for the future. Hours: Sunday to Saturday from 12:00 PM to 02:30 PM; 07:30 PM to 10:3opm. 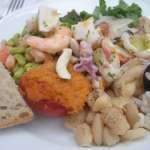 This entry was posted in General restaurant reviews, Italy, Regional food and tagged florence, italian food, italy, restaurant review, trattoria angiolino, tuscany. Bookmark the permalink.